Standing on top of the deck of the ship. 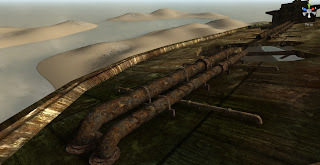 The Shipwreck is one of the medium to large maps being implemented into Carbon Combat. It features a large oil tanker stranded in the middle of a remote atol. A few debris from the ship is scattered around the island among palm trees and some splotches of grass. Oil barrels and cargo containers lay around the interior and deck of the tanker. This map is meant for team death-match/death-match style games as there are no clearly defined bases for each team to defend. If you have any other ideas or suggestions, feel free to comment below! Character Controls: WASD to move, hold space to jetpack for a limited time, mouse to look around. Hm, it seems that I've overwritten the old file with my network monitor lol. I'll see if I can fix that.